Wedding in Italy can get to be the most fascinating memory of your entire life. If you intend to make a wedding trip, then, we have an excellent prospect which consists of old traditions, modern style of life, moveable nature and dizzying architecture. The city between sky and land – that is how this location has been described both by aesthetes and common citizens. Ravello – town of music, source of inspiration of poets and artists. Frequently it becomes a place of famous masters` performances. They are both good at modern and classic pieces of art. Theatre squares and halls are always full of spectators. Getting married in Italy. How it is going to be? Rufolo villa, wonderful building, is considered to be the main decoration of the town. This place fascinates with its gardens and hosts music festival under romantic Italian sky. Villa Camborne – beautiful structure which was built in XIX century. It possesses not only amazing architecture in Arabic and Romantic styles, but also a delightful sea panoramic view. St. Pantaleoni Cathedral with a 35 meters high bell tower and San Giovanni del Toro church – the masterpieces of medieval architecture, are both worth to be seen. 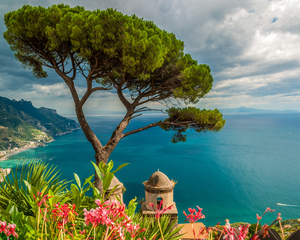 Ravello – a romantic place, where people fall in love with the life, profess their love to each other, glorify the love and put it on a pedestal of freedom. Wedding in Ravello is an opportunity to see the best sunsets, hear the music in a wind and in a rustle of leaves. It is the possibility to realize the true meaning of simply words “real love” in new way. Ravello wedding planning – breathtaking event. That is for sure. The main ceremony takes place in the most famous villa, which has an incredible sky-sea panoramic view and lush gardens. Many artists raved about building`s magnificence, viewing terraces and landscapes that surround location. Ravello is situated on Amalfi Coast at 350 meters above sea level in the region of Campania. Weather conditions allow to visit the island in all seasons. But it is better to enjoy a warm of sunny days in period since mid-April to October. In this time the most attractive and interesting events are held. How to get there? You can reach this paradise on the bus from Rome or Naples. Order the services of our wedding planner. We arrange a convenient transfer, so you can go with your passion and forget about all the fuss. Use phone numbers or request a call in the website header to contact our manager and learn more about route, ceremony, programme of events and prices.